Governor Nyesom Wike of Rivers State has flagged off his campaign for a second term, declaring that the All Progressives Congress (APC) has lost the political struggle in the state due to the greed of a political godfather. 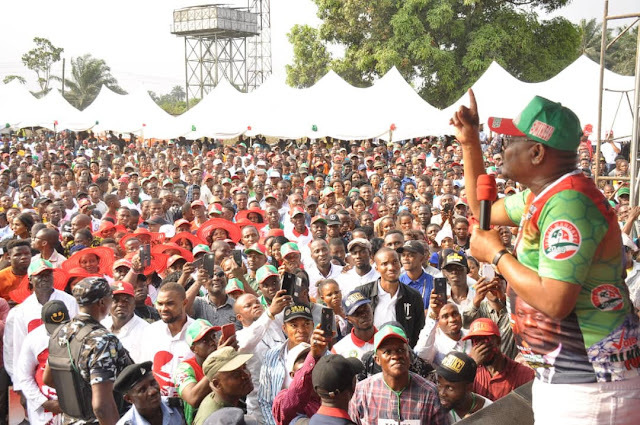 Speaking during the flag off of the PDP State Campaign Rally in Tai Local Government Area on Wednesday, Governor Wike said that the APC are presently looking for a political party to support during the 2019 General elections. He said that the APC has attracted no value to Rivers State, hence Rivers people will overwhelmingly vote PDP candidates. "I hear that the APC in Rivers State are negotiating for a political party to support during the 2019 General elections. But it is already too late", he said. He said that he has enterred a covenant with Tai people to deliver more projects for them during his second term, noting that they are under obligation to protect their votes during the elections. The governor said that over the last three and half years, his administration has planted key projects in the area. He announced that in the coming days he will flag off the construction of General Hospital. "This is a project I have agreed with Tai people to execute for the benefit of the masses", he said. He said despite the assurances of the New Inspector General of Police (IGP), Rivers people should remain vigilant. He said: "Anybody who rigs election in Rivers State will suffer God's wrath. If you leave your home to come and rig in Rivers State, your family will suffer the consequences ". Governor Wike said all the people of Rivers State are looking for, is free and fair elections, where the people will be allowed to choose their leaders. He charged the people of Tai Local Government Area to vote overwhelmingly for PDP Presidential Candidate, Atiku Abubakar during the Presidential elections. "Buhari does not like Rivers State. The only person that will help Rivers State is Atiku Abubakar. That is why we will vote for him", the governor said. Rivers South East Senatorial District PDP Candidate, Mr Barry Mpigi said the people of the area will vote Governor Wike because the Rivers State Governor is the father of modern Rivers State. Rivers State PDP Chairman, Felix Obuah said Tai Local Government Area is a fertile ground for PDP because of the key projects executed by Governor Wike. Commissioner for Special Duties, Dr John Bazia noted that Governor Wike has executed eight projects in the area. He said all Tai people are solidly in support of the Rivers State Governor. Hundreds of APC chieftains led by the party's women leader, Mrs Victoria Mgboh defected to the PDP. The Former APC Women Leader said they were attracted to the PDP by Governor Wike's performance. Popular musician, Harrysong thrilled PDP supporters in Tai Local Government Area during the campaign flag off.